A gentleman pounced upon us immediately and his vice like grip on us couldn’t be removed. We did the best we could do in that situation – we gave in. 500 he demanded. And so 500 it was. By the way, these gentleman have a code of ethics, once they pounce upon someone, no one else is supposed to pounce on them. So even if we had rejected this guy, no one else would have touched us. I thought the fare was steep, but half way through our laborious journey through ups and downs, I realised that it was tough work. My only foray into rowing was one weekend in Honnemardu. One hour in a boat and very sore arms later was enough to make me realise that rowing isn’t a piece of cake. Anyway, the coracle stops at a point from where we need to scale up the mountain rocks like the nimble footed Nilgiri Tahr. The only catch is that we aren’t nimble footed so much slipping and sliding later, we somehow manage to get to a decent vantage point of the roaring falls. The more enthusiastic and nimble footed have gotten a long way ahead, but we’re older, wiser and slower. 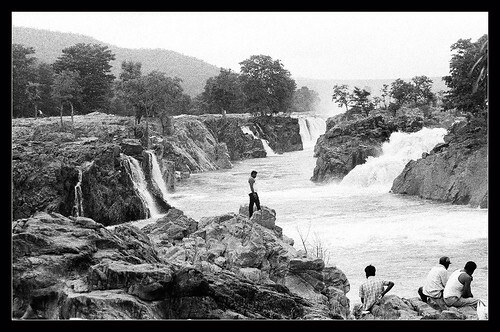 The falls gushes out from many points and plunges down, creating quite a spectacle. In the dry season, apparently, boys dive into the water from the top. But since the water level is too high now, there’s not much scope for activities of such nature. We go back to the coracle, where the gentleman is doing time pass with other coracle rowers. 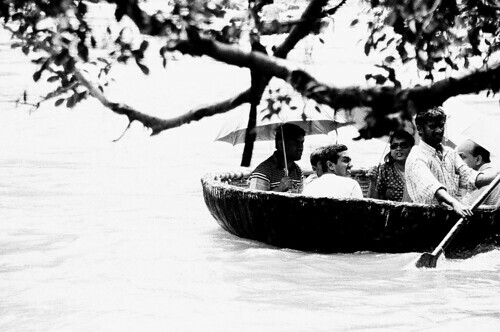 We all take turns and sit in the coracle. It makes weird movements like it’s going to sink but fortunately it doesn’t. We row along the side waters and look at other revellers on the banks. Some have dived into the waters (which doesn’t look clean at all). 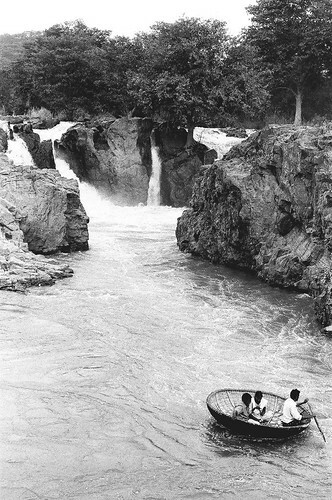 Others are beside in various stages of undress and dancing and making merry, having picnics and such things that Indians are wont to doing at these kind of locations. After an hour or so of rowing around, we make our way back to the beginning. It starts to drizzle slightly just as the coracle touches the shore and we run towards some shelter. 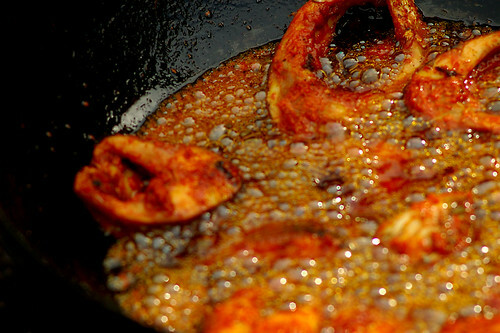 The overpowering smell of fried fish fills the air and one can see many women in various stages of the frying process – putting masala, grinding it, heating oil and then frying. Somehow, seeing is enough in this case. After an entertaining couple of hours, we get on our vehicles and begin the drive back. It starts to rain heavily. This time we take the short route and drive back to Bangalore. * It’s advisable to take your own vehicle. * You can also carry your own snacks as there’s not much to come by in terms of restaurants. But if you’re carrying stuff, please don’t litter the place. * Don’t jump into the water – ít’s not safe. There have been incidents of people drowning. 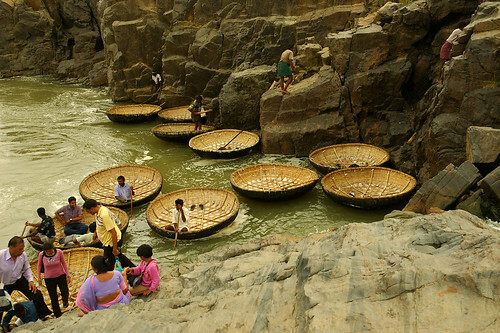 Hey i really liked your travelogue, i have also done coracle ride in my camp to Bheemeshwari. Well deserving nice write up, will plan my next trip here. It would have been nicer if you had mentioned which route you took out of Bangalore to reach that place.